Local election Of Nepal is coming up soon. Many of us are enthusiastic to be a part of the voting community to elect the leaders. The government of Nepal has announced that the elections will take place on the 31st Of Baishakh, 2074 (14th of May, 2017). To check who can cast a vote in the upcoming election and check if your name is on the voter list - Put your detailed datas on following screen and follow the simple steps as stated below. 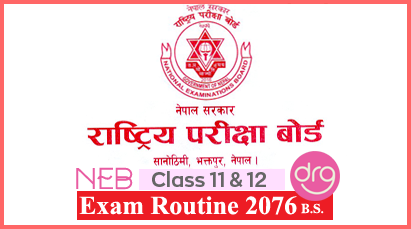 Final Nepal Election Result | Local Election 2074  | "LIVE"
I've made simple tutorial on finding out the names in Voter List. I got my name listed in Voter List and what about your's? Let see below detailed tutorial to find your name in Voter List. Step-1: Select the DISTRICT from the above table - See screenshot below; Or you can go through HERE. Step-5: After clicking on SUBMIT button, you will find a screen with detailed name list. Step-6: My name starts from Dha [ध]. 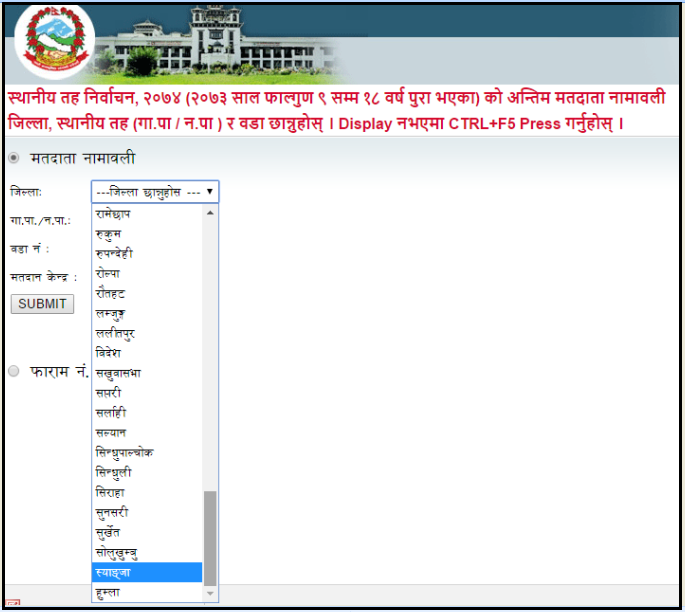 Click on Dha [ध] and you will find detailed name list that starts from Dha [ध]. Note: You can expand the Name List to search your name by choosing numbers [10, 25, 50, 100] from Show-Entries or just click Previous and Next button to search your name. 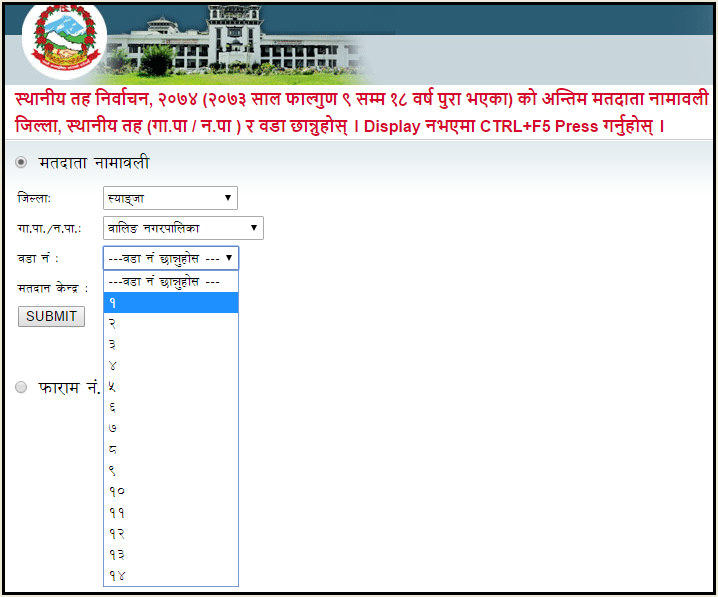 Step-8: To see your voter's detail with your picture, click on Matadata Bibaran [मतदाता विवरण]. 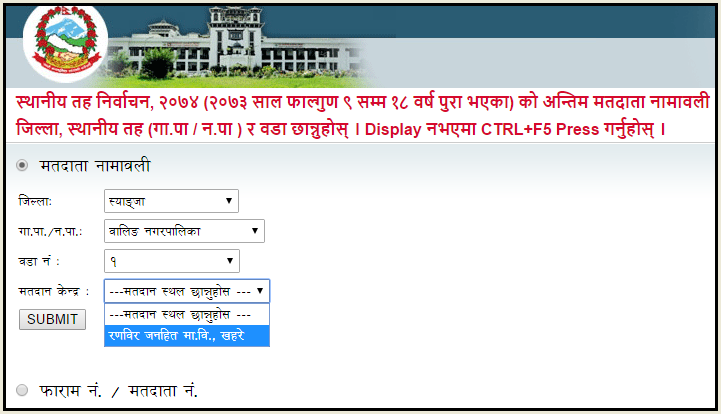 Step-9: Once you click on मतदाता विवरण, you will be redirected to a screen where you should fill up the Date Of Your Birth or Citizenship Number. 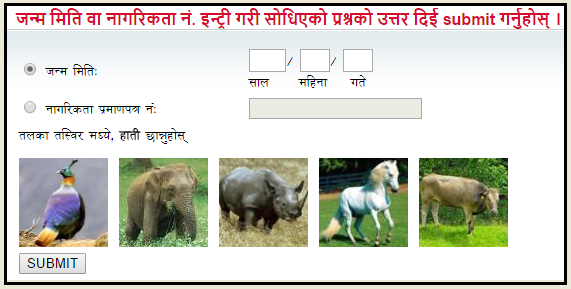 And Select the correct Captcha [Picture Of Animals]. 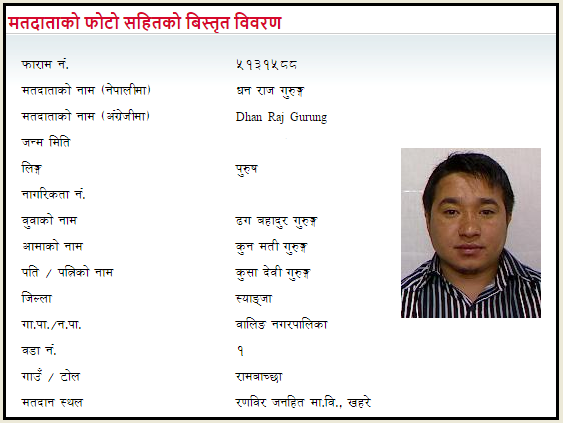 I hope you are now able to figure out your Name in Voter List and Voter's ID detail along with your beautiful picture. Wishing you all the best for Local Election 2074  NEPAL. Happy Days! 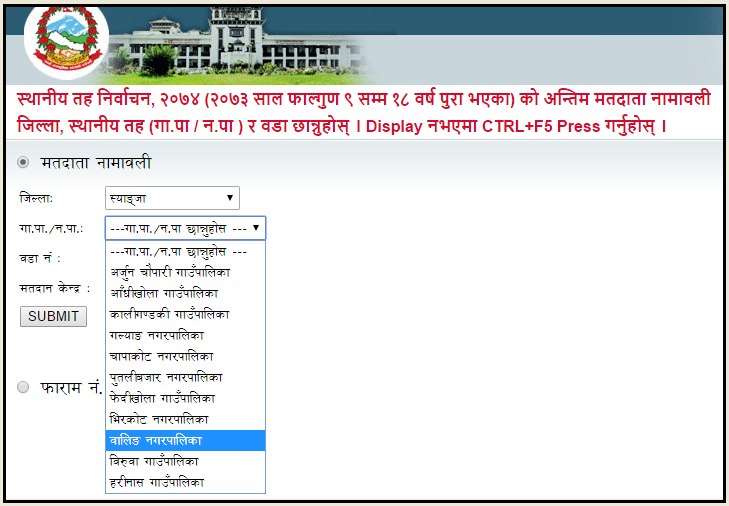 2 Responses to "How To Check Your Name In Voter List | Voter List Of Nepal | Local Election 2074 "
Hi Roshan Ji. It seems either the Form No. 1601321 which you mentioned above may not entered yet [यो फाराम नं छैन!] Or there should be error while submitting your complete detail. I would suggest you to contact HERE.